This is a revised version of the pattern Loki. 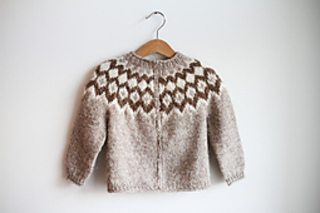 The new version includes the original cardigan version AND a pullover version plus steeking instructions for crochet steek. 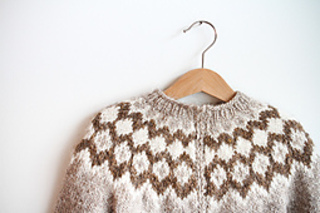 Loki is a comfortable and warm Lopapeysa knit from the popular Léttlopi produced by the Icelandic wool factory Ístex - actually the only spinning mill in Iceland! The pattern is classic and so are the colors. Although, changing the colors is really easy and totally up to you. 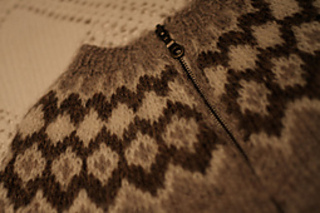 In spite of Loki’s traditional appearance, the top-down method used to knit it is not the usual way Icelandic knitters use when knitting the popular Lopapeysas. Some knitters, including me, really like knitting from the top. If this is your first top-down project I’m sure the method will grow on you – the advantages are huge. For example, your piece of knitting looks like something you can actually wear right from the start, you can try it on whenever you like and you can more easily modify and make changes as you go. 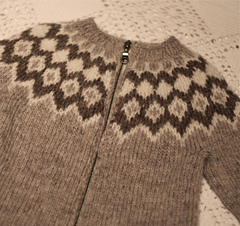 Loki is also an excellent project for first steeking (or just fun steeking). That means you cut it open after knitting it in the round, to make a cardigan. Steeking can eitier be done with a sewing machine or with the crochet method. Other: two pieces of scrap yarn, 2 stitch markers, darning needle and a crochet hook US G(6)/4mm. 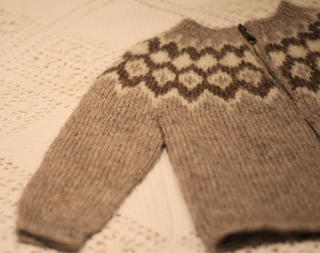 A zipper or buttons for a cardigan. For steeking: A ribbon twice the length of the front side, if you use the crochet method.